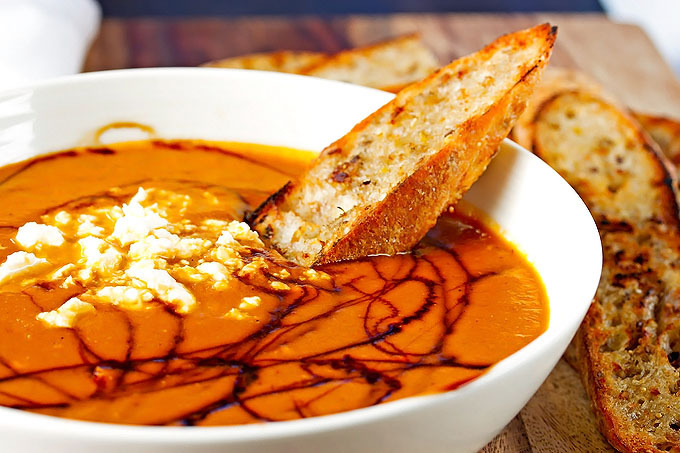 Roasted tomato soup that’s so quick and easy to make! Curb that tomato soup craving with this silky and smooth soup with an intense roasted tomato flavor that could never come from a can. Slightly sweet and a little earthy = absolutely delicious. I have had the worst craving for tomato soup lately! It all started when my girlfriend Jenn sent me a picture of tomatoes she had just roasted for soup. They were all roasty and melted and swimming in tomato juice and olive oil, gorgeous and golden. Well that got me going. Then two days later Debbie told me she was making tomato soup and started sending me pictures too! Well, Kevin and I were still living in the trailer outside and I barely had a kitchen so when I went to pick up food for dinner, I was so glad they had tomato soup on the menu. I had the tomato soup bug so bad that I had it that day for dinner and then I went out and bought a big container of it and had some every day for the next 4 days. I also made sure that Debbie saved me a little of hers so when I was at her place a few days later, I had some then too. I told you it was a bad craving! This is Debbie’s recipe and since I have recently sampled several different kinds of tomato soup, I can tell you that this one is where it’s at! Silky and smooth with that intense roasted tomato flavor that could never come from a can. Slightly sweet and a little earthy = absolutely delicious. I think I need some more… Now! Lucky for me, this tomato soup is incredibly easy to just whip up quick whenever you’re like me and have a wicked craving for this lovely stuff. By the way, Debbie had her soup with a sprinkle of feta on top, I like parmesan or cheddar, but if you want to get really fancy, a sprinkle of parmesan or gruyere followed by a small handful of chopped basil would be outstanding! 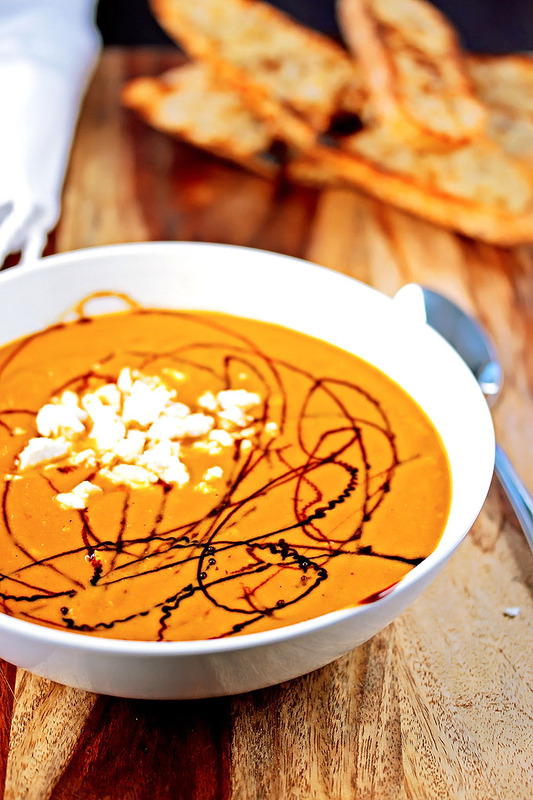 Better yet, top this tomato soup with some homemade croutons! They are so easy to make and will blow any store bought croutons out of the water. No kidding! 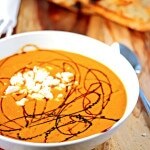 Roasted tomato soup that's so quick and easy to make! Curb that tomato soup craving with this silky and smooth soup with an intense roasted tomato flavor that could never come from a can. Slightly sweet and a little earthy = absolutely delicious. Slice the tomatoes in half and place them on a parchment lined baking sheet. Add the peeled garlic and thyme to the baking sheet. Sprinkle with salt and pepper. Bake for 45 minutes. In a medium pan over medium heat, saute the onion, carrots and celery for 5 mins or untill veggies are soft. 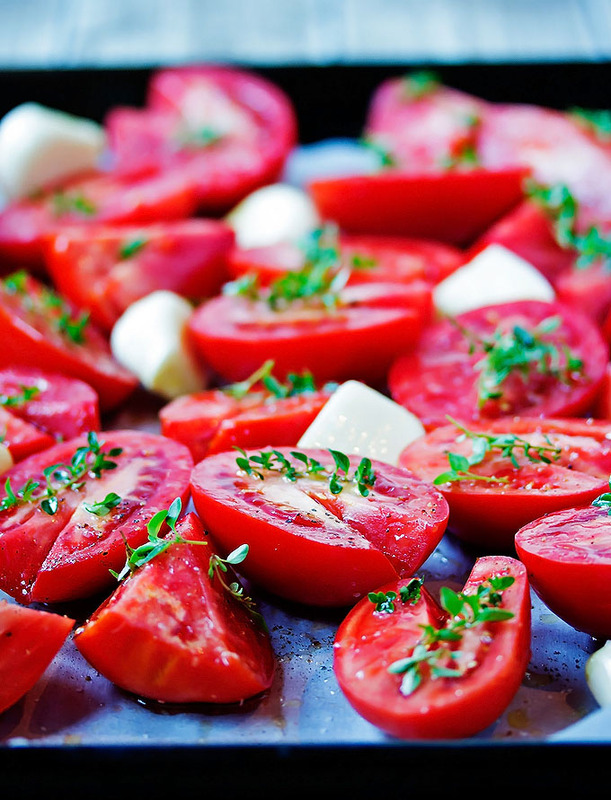 When the tomatos are finished roasting, add them to a blender along with the fresh basil and onion mixture. Blend untill smooth. Add the tomato puree to a larger soup pot and then add the rest of the ingredients. Heat thoroughly. Garnish with feta. parmesan or cheddar cheese and drizzle with balsamic vinegar. Serve!